Will was a great interviewer. He is a really lively guy who knows how to communicate a lot of information in a fun way. Kudos to Will. 1. Yield rate - out of the applicants you accept, what percentage of that end up attending? A third and half end up attending. Some qualities are looked for specifically in each applicant that we think will contribute to the best sort of class experience. 2. How many drop out after simply experiencing the pre-work? How much time should I dedicate to the pre-work? No one has dropped out yet. The average student needs 25 hours per week in pre-work. 3. How many college students have you had in the past? The typical age of participants: mid–20’s - 25, 26 - with a couple of years of experience. Some are quite a bit older and want to transition careers or are coming to learn more technological aspects of design. There has been someone from CMU that took a semester off and attended Designation over the summer as well. 4. What kind of process do your instructors go through? All evening instructors have been with us since the beginning. All are very familiar with the content and building the curriculum was a very collaborative process. As much as I’m an okay coder, we wanted to bring in people who knew more about the aspects that others weren’t that good in. So we work with instructors to nail our instructions down, so the assignments can be changed and developed over time. There is a lot of feedback interchanging between founders and instructors - definitely a dialogue. 5. What is your background? How were you introduced into the tech/web development scene? All throughout school, I was in food service. Working in copyright, video editing, and advertising for about 5 years. I like advertising and I think it’s in a weird kind of state now (symptomatic of something larger). Advertising connects us to new ideas and experiences which props up the entertainment industry. It’s the reason I got into Designation. My role as an admissions officer involves me interacting with comically large wide range of experiences and places from all around the world (from just about every continent now). Each applicant is different, but they all tell me that handful of stories (let’s say they’re early 30’s or late 20’s): “I’m making money, but I still wake up and am not doing what I’m supposed to.” or “There’s something else I wanted to do and I want to, in a relatively short time, dramatically change my skill set.” Millennials, especially, they want to be creative. I got involved and co-founded this program because I felt the same way at some point, because even though I was doing something creative and felt I wasn’t doing things that weren’t being used at my old job - it just seemed like something fun to do. Will is really an interesting guy! 6. What do you guys recommend students do outside of the course? The program is 70 hours a week. There is no time outside of the course. It will be your life for a few months. The boot camp philosophy is that you have a short amount of time and you do it day in and day out for the time you’re here. In Chicago - there’s a lot of Meetups. People who come from out-of-town can really focus on the program because there are fewer distractions. 7. Do you think an undergrad graphic design major can benefit from your program? I think an undergrad student can benefit. In most graphic design curriculums there is heavy emphasis on print design and students are not ready to make interesting and engaging websites. Frequently, colleges are not incentivized in all disciplines to stay modern. Print design is an important skill to have, if all you are is a print designer, but it’s not where most of the best work is done. Technology is always evolving - there’s always something new. But there has been no major evolution in print design curriculum, so grads won’t be ready. If we want to change the curriculum, we can. We have no one to answer to except ourselves and the happiness of our students. That’s what distinguishes ourselves from alternative options. SO ON POINT! 8. What are the backgrounds of the students overall? 1⁄3 of our alumni have some amount of professional design experience - and they’re in their mid to late 20’s, but they are not doing the kind or quality of work they want to do. Next 1⁄3 of our alumni are in their late 20’s all the way up to late 50’s. They haven’t had much experience with creative fields or web dev. Then the last 1⁄3 of our alumni are students, recent college grads, and miscellanies. I really love how knowledgable Will is! I was accepted! Here’s part of the acceptance email they gave me. 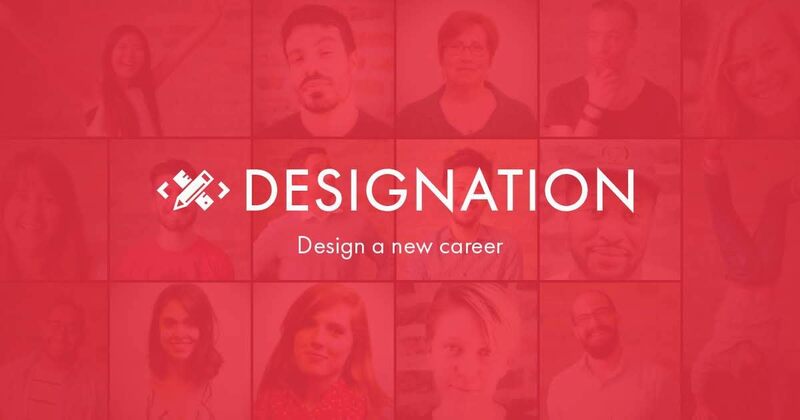 We're excited to officially invite you to be a part of the DESIGNATION - Full-Stack Design program! We think you would make a really great candidate for our program, and we couldn't be happier to have the opportunity to work with you. You get set up with an account on Lynda.com once you pay the first deposit. The total cost of the program is $6K. You have to officially confirm your acceptance no later than 1 week from today (I made sure to explain to Will I would need more time to make my decision, and he understood, so again, kudos to Will and his quick feedback! ).